I love KL–KUALA LUMPUR! And that’s why today and for the next few weeks, we are at home exploring some of the older parts of this charming city. Some know Kuala Lumpur as a metropolitan city that never sleeps. Some call her a city that always eats, and that’s how she grows and keeps on rising to expand her waistline to form what we call today the greater Kuala Lumpur. The greater Kuala Lumpur’s area is covered by 10 municipalities surrounding Kuala Lumpur city and is today home to over 7 million people from various parts of the country and world. And speaking of ‘eating’, one would hardly ever go hungry at any hour. Just drive out a couple of kilometres, and you are bound to bump into a friendly neighbourhood restaurant or stall. 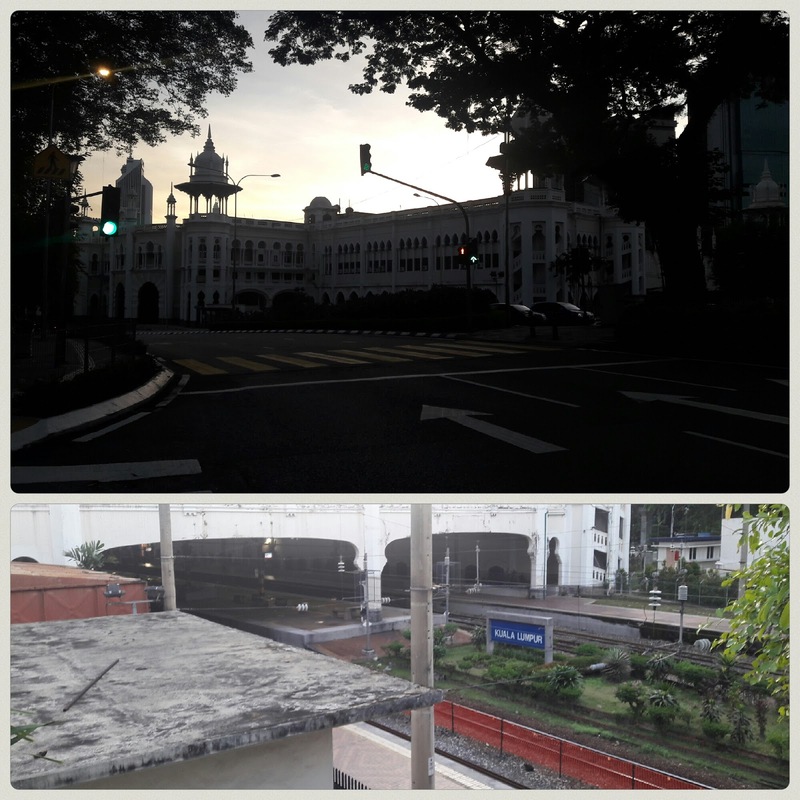 There are newer parts of Kuala Lumpur which I also like, but our early morning walk today is to look at the older jewels. The time is 6.15 am. It’s a rest day, and the city is mostly ours for the next few minutes. My first stop is one I had passed by every single day during my secondary school days commute: the Kuala Lumpur City Central Railway Station. Grab your perfect spot across the street, wait a few minutes and there! Watch that magnificent sunrise over the beautiful Neo-Moorish styled domes and horseshoe arches. The station is located on Jalan Sultan Hishamuddin (previously known as Victory Avenue). This was built in 1910 to replace an older station at the same site. The design of the station was undertaken by Arthur Benison Hubback, an English architect who had also worked on several other notable buildings in British Malaya. 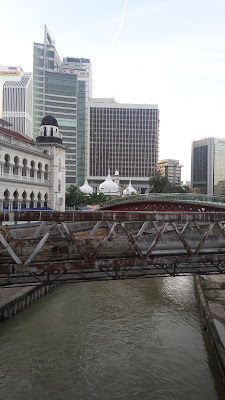 This station was once the central station for long distance intercity commuters up until 2001 when the traffic was diverted to the new Kuala Lumpur Sentral (KL Sentral). Today the station serves as a stop. The building also had a hotel to serve its passengers (Heritage Station Hotel). I did once have coffee at the coffee house at the Heritage Hotel some 20 years back, decades before I started my coffee trail blog. 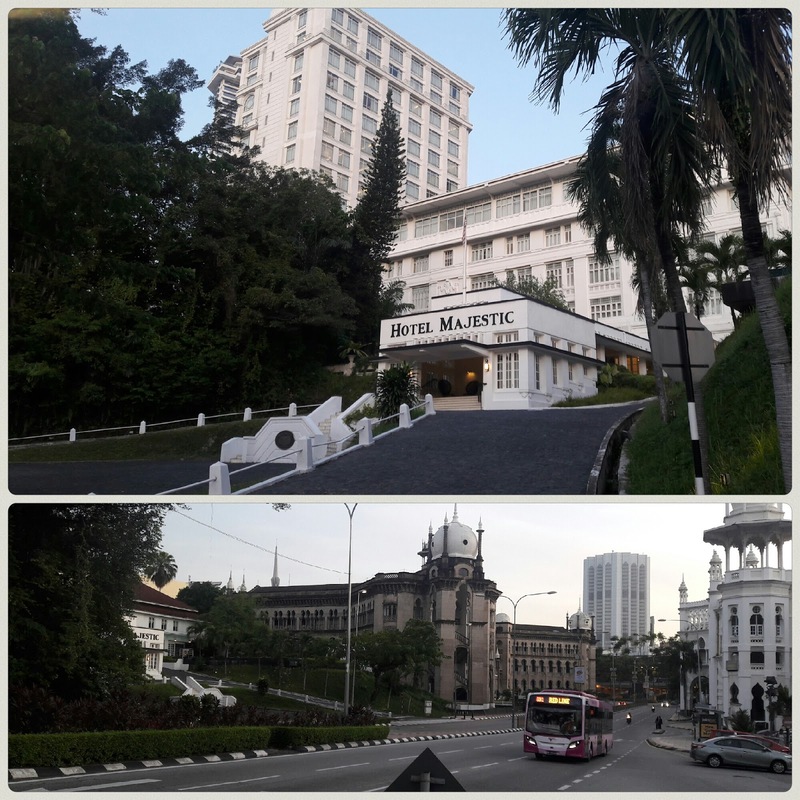 On my left, opposite the railway station, is another famous landmark, the Hotel Majestic. Stay with me–there are lots of dates to digest here. Be assured, history was once one of my favourite subjects, and if you have read some of my other postings, you would realise that connection. This hotel originally opened in 1932 for guests. Just like the railway stations, this building’s architecture was also influenced by the transitional hybrid of neoclassical and Art Deco styles. The 51-room hotel then served as a more luxurious option compared to the Heritage Station Hotel across the street. In the past, Hotel Majestic had also been used for political reasons - as a transit camp by the Japanese occupation government and then years later as an important party and government meeting venue during pre- and post-independence from the British. In 1983, the hotel was officially closed for business, and in 1984 the building was used as the national art gallery. In 1998, a new gallery was constructed and took over that role as the new National Art Gallery (on Jalan Tun Razak). A few years later, the Hotel Majestic was refurbished, remodelled, and once again became alive in December 2012. Today it has 253 rooms in a new tower along with 47 rooms from the original majestic tower wing. I don’t know what happened to the remaining four bedrooms. 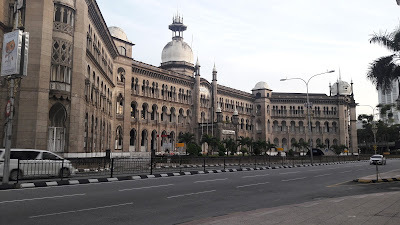 Next to the Majestic Hotel, heading towards the direction of the city, is another Neo-Moorish styled building belonging to the railway station authorities. It is used as an administrative office. 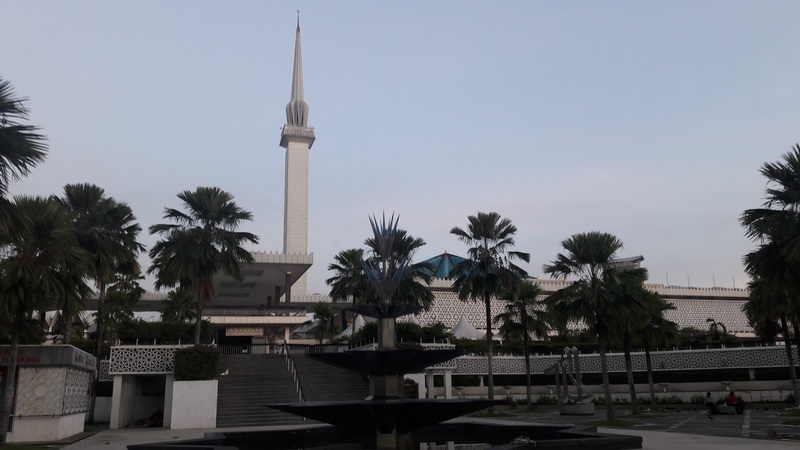 I keep to the path and approximately 200 meters away from the station is the National Mosque, a beautiful 16-pointed star green-blue roofed styled building that has a capacity for 15000 people. I learned a few more new details - the original structure was designed by a 3-person team (the UK and Malaysian architects) and was built in 1965. Its original roof was a pink structured one. If you have a picture of that, please do share it here. I would love to see it. Keep walking, and you’ll pass by the Methodist Girls Secondary School, but you would not be able to see it from where you are, as it is quite hidden. The school celebrated its 120th anniversary in grand style in 2016. 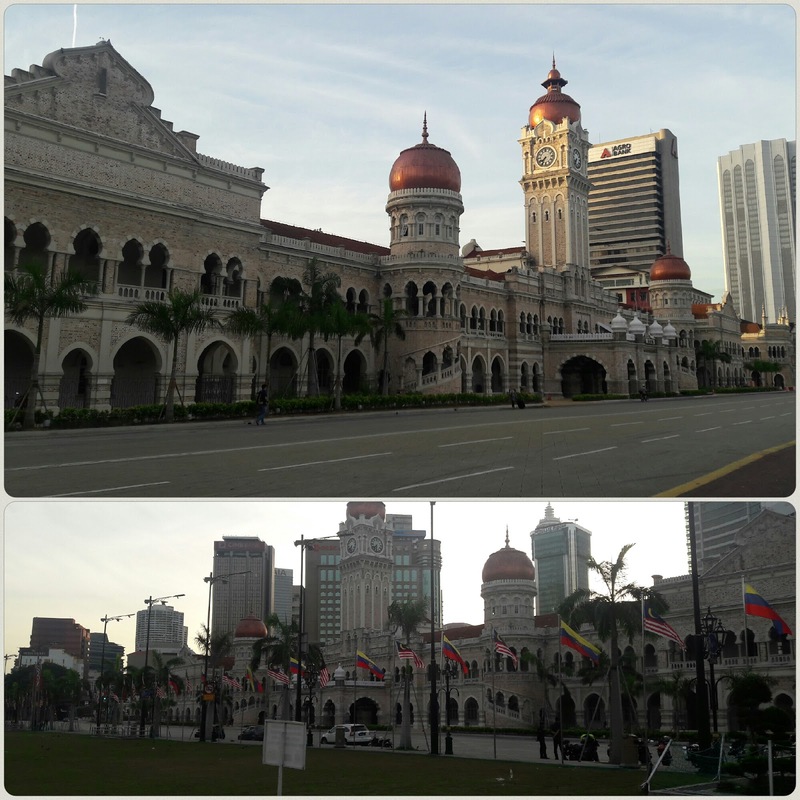 Across the street is the Daya Bumi complex, comprising a 35-story tower building and the General Post Office Building. Here is where you can get your first day covers or previous covers/special stamps, PO Boxes, and other special postal needs. Don’t ask why, I know I am not a celebrity, but I did have a dedicated PO Box for a very long time here in the 90s 😊 and this would indicate to you how often I’d come here in the past. I did not get any real mail, but it got filled with lots of marketing brochures. Both buildings have a white marble finish. This complex was designed jointly by two local architect companies. The design is Modern Islamic. It was completed in 1984. The tower is a commercial building. This was used as the main office for Petronas before the Petronas Twin Towers was built. ** At present, I don't have a close-up picture of the building, but you have a glimpse of it above (view with the railway station). After the tunnel, you will find yourself in another historic landmark. Take a deep breath because this is a grand place. You’ll see a lot here, but let me help you visualise some of them. First Dataran Merdeka (Independence Square). 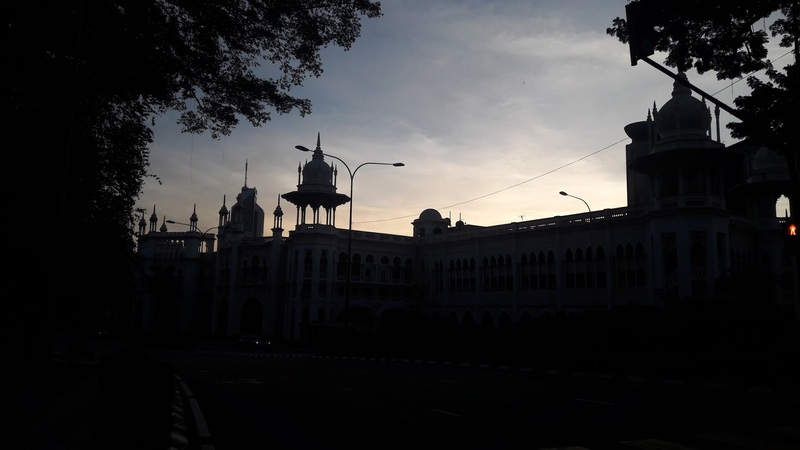 Located in the square is the Royal Selangor Club founded in 1884, once the meeting place for educated and high ranking British colonial society. I think it is still difficult to get membership in this club 😉. 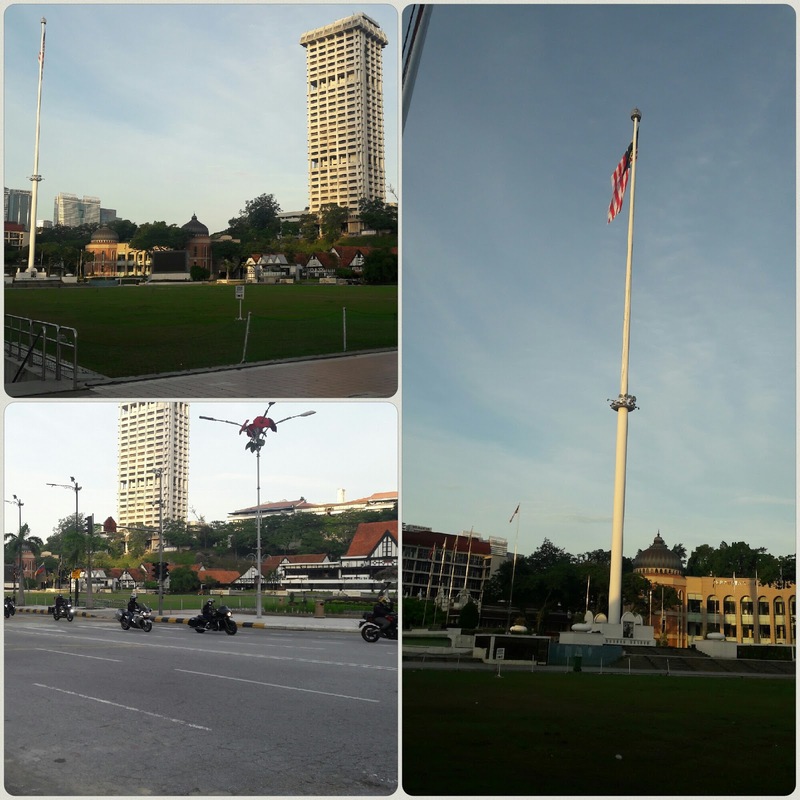 It was at Dataran Merdeka on the midnight of 30 August 1957 that the British Flag was lowered and the Malayan flag was raised. To the north is St. Mary's Anglican Cathedral which was built in the mid-1890s.The cathedral is an example of English Gothic architecture. This is open for all visitors. 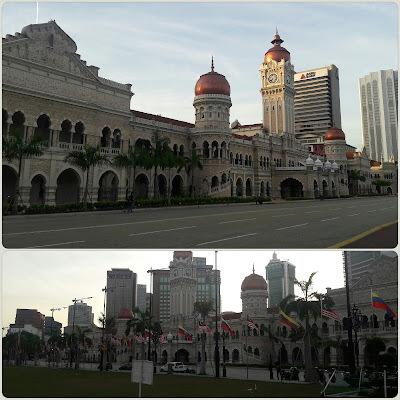 In front of Dataran Merdeka is the grand Bangunan Abdul Samad building. The building was first used in 1897 as government offices during the British days. The building also housed the superior courts of Malaysia (Federal, Appeal and High courts) up until the early 2000s. R.A.J Bidwell and Hubback were both responsible for its design. This is a 2-story building, stretching along Jalan Raja. This was the largest building in Malaya. There are three towers with copper-clad onion domes; the central one is the 41m high clock tower. This clock still functions today. It is 7.30 am now! The Dataran Merdeka area is usually closed to motor traffic on weekends, and this becomes a favourite hangout for tourists and locals. This is a common place for events of all scale – such as national day marches, flora parade, cultural shows, marathons and sporting events. During FIFA world-cup, live matches are shown here on the giant display, so join me and others for the next. This morning there is a group of super-bikers assembled here before the start of an expedition. I cheered them on as they left. Kuala Lumpur is the national capital of Malaysia and is one of the leading economic powers in South East Asia. Tilt your head up. Across the river, the odds of sighting a local or foreign bank building nearby is good. This area is also the financial centre of the country. I am now at the end of Dataran Merdeka, and if I go straight north on this road, I’d be at the well-known shopping district. But it’s still too early to start spending. As I write this entry, though it was just a short walk, it has opened me up to a lifelong wealth of knowledge and a deep sense of appreciation for the roads I have travelled on and the greatness of the buildings I see every day. 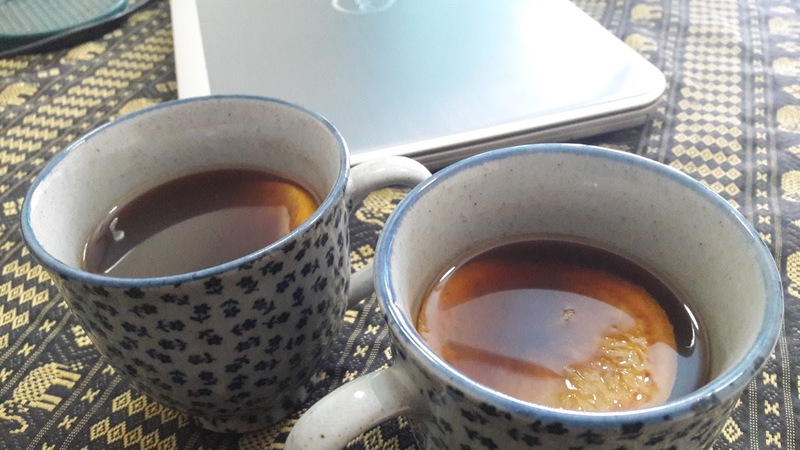 And of course, as usual, there is always coffee for you and me no matter where. I am back home; the fragrant morning city air is still wrapped around me. I wanted something personal. I made myself a Normandy coffee, a recipe from The World Encyclopaedia of Coffee, a book my friend and colleague Joyce had lent me when she heard about my blog (and of course, not forgetting my sister for getting me that huge and heavy hardcover of the same. It survived TSA!! I will read every word of it!!). Normandy coffee is a tangy-apple-spiced hot espresso, just right to absorb in all that well-flavoured history I learned today. It is named after a region in France known for its apple orchards. I hope my morning walk has set you on the trail of curiosity to explore your city and perhaps mine too someday. I can’t wait to hear your experience, so tell me more about it. Until then enjoy the walk, take in your city, enjoy your cuppa, maybe a Normandy, and have a good week ahead. * Note: references are made to online archives for historical facts. A Poet, A Monk and the Rock-Star!! !